"I wanna block 66% of the Carbohydrates I take in my body because __________." 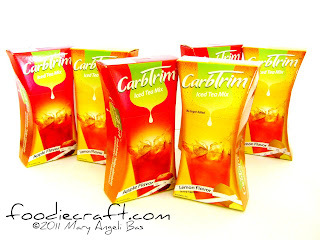 Email your complete name, age, city, and your continuation of the quote to angeliysama@yahoo.com with "CarbTrim Iced Tea" on the subject box. A reader should only have one entry. The owners of the top 3 best lines will get 1 Apple Flavor and 1 Lemon Flavor of CarbTrim Iced Tea each. Contest is open to anyone aged 18-30. Deadline for entries is on October 8, 2011. Winners will be posted on October 10, 2011 and will be notified via email. *Compliments to Harold and Niza of Stratworks!